The weather around here is finally starting to look like spring might be around the corner! Snow is melting!!!!!!! The beautiful part of this time of year is that the ground is still quite frozen, so our yard turns into wonderful spring mud puddles! There is nothing quite like playing in the spring mud! 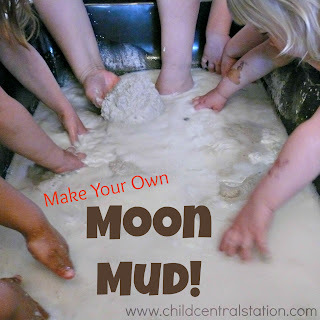 Last week- we looked at some more mud play on the swing! I have updated the post to include additional insights into the learning that took place during the play. You can see the revised post here. SO much going on here! I bet they are learning about liquid density by pouring and raking the water and mud, as well as learning about changing states from ice to water! Great pictures!! !